New England is home to dozens of producers, each making their own array of amazing foods and beverages. It’s top-notch stuff and happens to play nicely together. It’s a shame more people don’t reach for cider when enjoying a morsel of cheese, or food in general. Everyone runs to wine and beer. Ever the third-place choice, cider can be every bit as complex and engaging a dining companion as it’s two more popular contemporaries. With the burgeoning cider scene, that needs to change. The local coffee roasting community is bringing a whole new meaning to Beantown. Did you know that Massachusetts has a well-established and growing community of coffee roasters? It’s easy to think of coffee as coming from the far corners of the earth. While it’s true that coffee beans are grown in subtropical regions (that’s definitely not New England), in order for the beans to become what we know and love in our morning cup, they have to be roasted. And they can be roasted anywhere, so why not right here? There are a lot of dedicated coffee roasters who agree. Looking for something a little more eye-catching next time you head out to dinner? Hint: we're not talking about the skyline. Raise the bar on your dining experience by adding conversation-worthy art to the menu, making your meal a truly unique experience. Who says you can’t have it all? Vowed to eat more fish, nervous about buying seafood or simply want more control over your filets? Head to a local market and get help from a fishmonger. We're in New England, after all. I have a confession. Even as a fairly confident home cook, I’m intimidated by fish. Let me take you down the path of my seafood anxiety. First, for a protein that be so expensive, it sure is easy to overcook. The local brewery is quickly making a name for themselves by adding some modern creativity into traditional styles of beer. Tucked into an industrial park just off route 1A in Norwood, Castle Island Brewing Co. is a beer lover’s oasis. Named 2017’s Best New Brewery by the Massachusetts Brewers Guild, they are quickly making a name for themselves one beer at a time. Where's The Best Cup Of Coffee In Boston? Sounds like a straightforward question, right? We asked our colleagues at WGBH and found that, as a hotly debated topic, it’s right up there with religion and politics. In 1773 Bostonians dumped tea in the harbor, switched to coffee, and have never looked back. Today, coffee is a serious business round here, and opinions on where to get the best cup vary wildly. It's not always just the quality of the coffee that keeps customers coming back to a certain venue; it might also be the inviting ambiance, the friendly service, or just a certain vibe that feels right. Here’s what we learned when we polled staff at WGBH about their favorite coffee shops. Read more about Where's The Best Cup Of Coffee In Boston? Somerville's Field & Vine prides itself on a local-first, organic and sustainable ethos. But sourcing for a restaurant outside of conventionally available produce comes with caveats. This piece started out as a search for the best organic restaurants in the Boston area, but it started to get complicated early on. Some products are nearly impossible to find organic, some farms operate according to organic guidelines but are not officially 'certified organic' and many restaurants that identify as all-organic fall under a very specific hippie-crunchy category. There’s nothing wrong with a good grain bowl, but if you’re looking for a place that places a priority on the way their produce is farmed and is serving creative cuisine, where do you go? What Are Boston's Best Sandwiches? Employees at WGBH weigh in on what's got them under their thumb. Deli's, bodegas, speciality shops — you can't walk a block in Boston without running into a sandwich shop. And 'running into' them we are. Boston is a city that loves its sandwiches, and the offerings are delicious. Defining the "best" is a disputable topic. Fall too far down the rabbit hole and it can get existential. But the one thing you can count on is that everyone has a favorite, and we asked folks around WGBH to weigh in on the subject matter. We were more than delighted to see results coming in from all over the sandwich spectrum. Read more about What Are Boston's Best Sandwiches? Everything's coming up roses in the growing neighborhood, with new developments in housing, business... and dining. WGBH has been over in the good ol’ 02135 (that’s Brighton for you muggles out there) for a little over ten years now. For a while it was just us, New Balance and a few other mid-size organizations. But these days, business is booming in the area now operating under the moniker "Boston Landing". From new practice spaces for the Bruins and Celtics, to apartment high rises, the face of Guest Street has had a complete makeover. Where Are The Kid-Friendly Restaurants Near Me? Are the kids hungry, but you just don’t feel like cooking? There are some fantastic places in the Boston area for families to chill out and chow down, all without taking out a second mortgage. The Boston area is a hotbed of great restaurants, most of which I wouldn’t dream of going to with my family. For one, we’d have to go hungry for a week to afford it. Then there’s the stress of trying to eat, while simultaneously keeping three boys in their seats and using their indoor voices. I wouldn’t say my husband and I have the worst behaved kids in the Greater Boston area– to be honest we even get the odd compliment from time to time. But there are three of them and things can get, shall we say, expressive at times. Read more about Where Are The Kid-Friendly Restaurants Near Me? Tiffani Faison may be a world traveler, but she's made a home for herself in the Boston culinary scene. 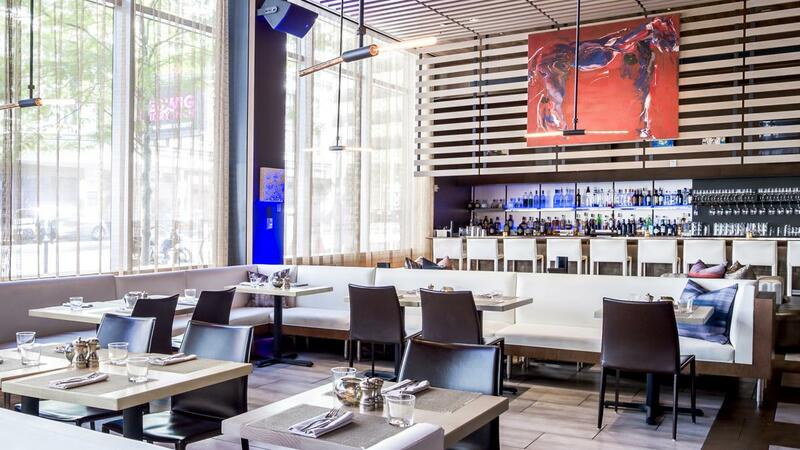 From a Top Chef finalist to the top chef of Fenway's Boylston Street corridor, Tiffani Faison has long been one of the rising stars of the Boston restaurant scene, working her way up the culinary ladder. But in the eight years since she first took on the top chef position at the now-defunct Rocca, the self-described 'army brat' has settled into Boston, making it her home. More than that – she's gotten comfortable. Need a can’t-miss Valentine’s Day idea? Victoria Kichuk has the answer, and you bet it includes chocolate. As we creep closer to the most romantic holiday of the year, some people start to sweat a little bit about gift-giving. How to express affection in a way that’s well-received and thoughtful, yet unique and shows some creative effort? For local chocolate expert and business owner Victoria Kichuk, the answer is simple. Tell the object of your desires to take a hike. It’s more of a walk, actually. Plus, there’s a lot of chocolate involved. Tucked back on the second floor of the Westin Copley Place Hotel, Anya Zelfond packs a world of chocolate into a suitcase-sized shop. Gourmet Boutique is reminiscent of what one might expect to find in a Willy Wonka movie. Every precious inch of display space is crammed with treats from all over the world. From floor to ceiling, products from France, Belgium, and other expected sources are side-by-side with exotic bars and bon-bons from Vietnam and Lithuania. Australia has a section. Artisan chocolates from Italy and the United States pop up here and there. The diversity is rivaled only by the selection. It’s a chocolate lover’s dream. Stave off the winter blues with these Southern comfort dishes around town that’ll surely warm your soul. As we enter the second half of a long Boston winter, comfort food is as necessary as a good warm coat, and what type of food could be more comforting than Southern fare? From barbecue to biscuits, here are some spots where you can find delicious Southern-style comfort food in Boston.